This Business Rule will trigger a predefined action (create, move, update, send a notification, call web service) whenever a comment is added via the email integration feature. For example, you can move a card to "Waiting on us" when a customer replies to one of your emails -> the email is processed by the email integration ->and created as a card comment. Note: You need to have set up the email integration first and to be able to send/receive emails from the card comments in trigger the rule. Go to your Administration panel by clicking on Administration at the top right of your screen. Open the Business Rule tab -> and select the "Card updated by email" rule tab. You can share the rule with other users (e.g. with a Workspace managers), if appropriate. In this case, they will be able to edit/disable/enable the rule. 1. WHEN - this is the event which will trigger an action when it occurs (i.e. a card is updated by email). For all time-related fields you can select the following units: Days, Hours, Minutes, Seconds. 3. THEN - Select an action to be triggered. Click on Add new action under the type of action you wish to be triggered -> select your preferred action if there are several options -> click on Add -> choose the value from the dropdown or click on Not set to configure it. You can add more than one action from one type by repeatedly clicking on Add new action and configuring it. Practical tip: When a Card is updated by email and the Board is "X" -> Create a Subtask. Define the subtask during the configuration process. 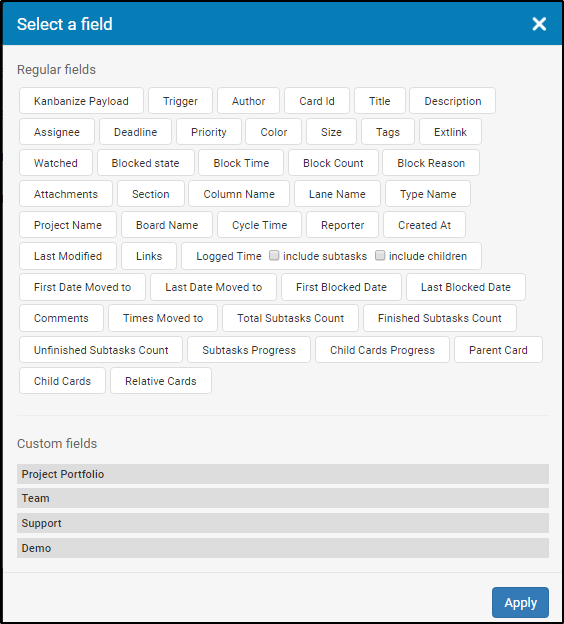 Select a regular field or a custom field that you have created and added to the corresponding boards in your Workspaces- > click on Add. Choose the value from the dropdown or click on Not set to configure the action. Practical tip: If a Card is updated by email and the Board is "X" -> set a deadline. Define the deadline during the configuration process. 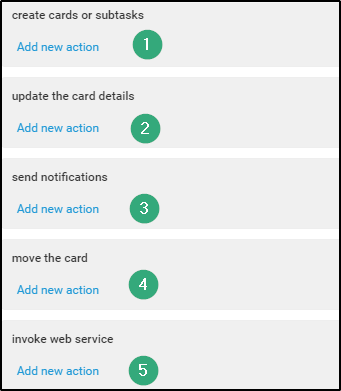 3) Send notifications: The system will notify a user of your choice when a card was updated by email. Create a template for the notification, which is to be sent and click on Save Message. In the To:/Cc: field -> -> use the "add internal users" dropdown which opens a list of all users in your account including: Self, Assignee, Watchers, Contributors, Reporter. Select and add the user/s you wish to be notified. The "add custom field" option is used in the following case: if you have a custom field with an email address and the created card contains this custom field, the notification will be sent to this email address. The subject of the notification email contains by default the card ID and the text "was updated". 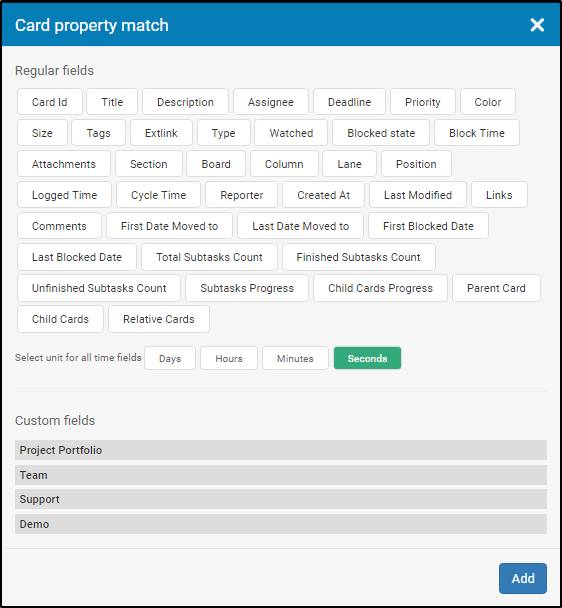 ou can modify the title by clicking on add card fields and select your preferred field/s or you can remove all fields and write a custom title. 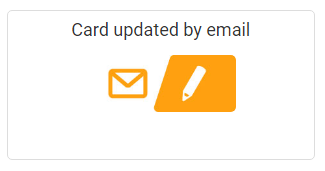 Practical tip: When a card is updated by email and the Board is "X"-> the system will automatically send an email notifying a user (e.g the Assignee). 4) Move the card: choose where to move the card. Select a board from the dropdown and a position from the board minimap (you can select a cell or an entire column/swimlane by clicking on its name). Practical tip: When the card is updated by email and the Board is "X" -> move the card to the "Follow up" column on the same board. 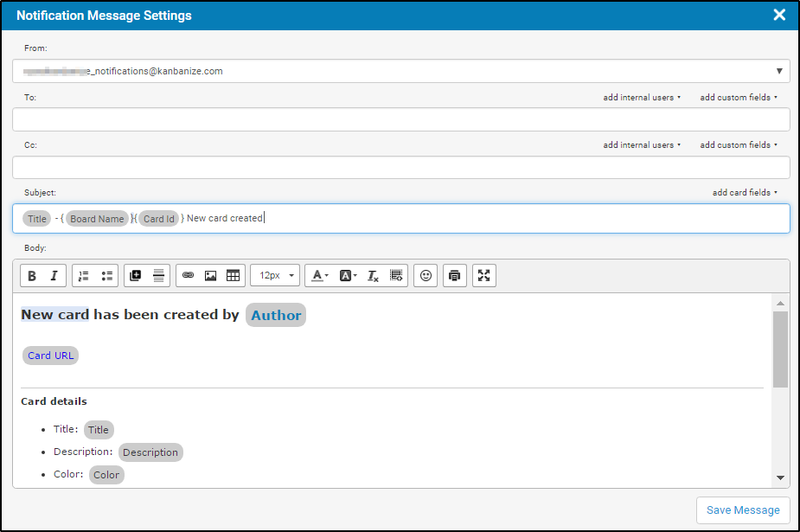 This option is very useful for creating an email tracking scenario on the Kanban board. 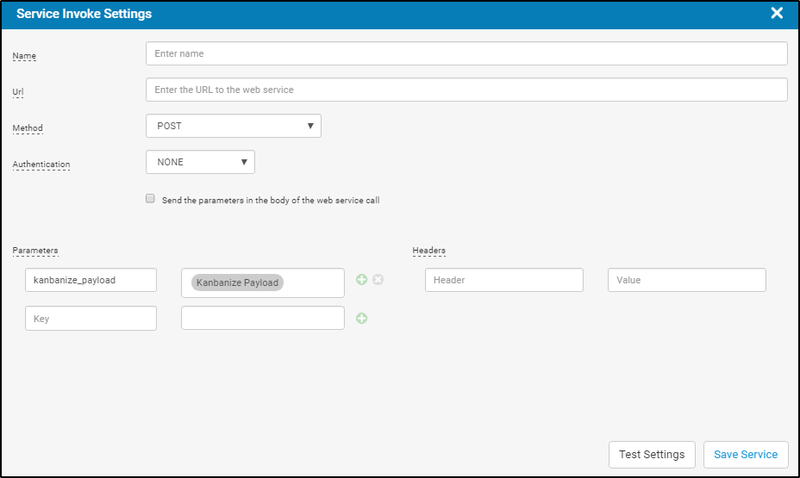 Click on Add new action to add a call to external web service -> click on Not Set to configure the parameters. Click on the green plus sign to add a parameter. Select a field you wish to set as parameter -> click on Apply. To enable the rule-> click on the green check mark at the top right corner of the configuration panel. Click on the red x-sign to cancel the creation of the rule. 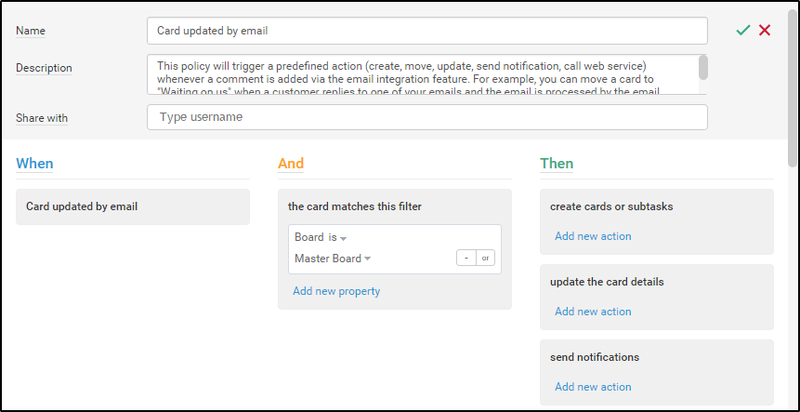 Read more to find out how you can use the "Card Updated By Email" business rule for "Email Tracking" on the Kanban Board.